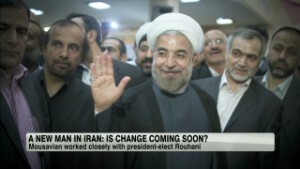 The new president of the Islamic Republic of Iran will be elected on May 19. Iran's Guardian Council will also vet the "ideological qualifications" of each candidate. Here an initial overview of the candidates. The 68-year-old Rouhani is thought to have the best chance of winning the May 19 presidential election. And that is not only because presidents of the Islamic Republic of Iran have almost always been confirmed for a second term since the republic was founded in 1979. Rouhani also enjoys great support among young Iranians, especially the urban educated - despite the fact that he was unable to make good on his 2013 election promises of delivering more freedom, releasing political prisoners and advancing equality for women. Seventy percent of Iranians live in cities, and they are happy that their country is on the path to rapprochement with the West. Iran's nuclear deal with UN Security Council members and Germany (5+1) has freed the country from its former isolation. When the campaign officially begins on April 28, it is expected that Rouhani will focus his message on upholding the nuclear deal. When filing his registration, Rouhani emphasized: "The nuclear deal is one of Iran's most important political and economic issues. Those who have repeatedly attempted to kill it must not be allowed to become its custodian." Rouhani will likely repeat several of his 2013 campaign promises as well, such as more freedom and more rights for women. The 57-year-old Raisi is one of religious leader Ayatollah Ali Khamenei's closest confidants. He is considered to be the leading conservative candidate in the race, and thus, Rouhani's most dangerous challenger. Raisi has led the powerful "Astan Quds Razavi" charitable foundation since 2016. This is an administrative organization entrusted with protecting the Imam Reza shrine, a holy site for Shiites. Imam Reza plays a special role for Iranian Shiites, and the shrine receives massive financial donations. Astan Quds Razavi is the most powerful business in Iran, owning banks, factories, companies and hotels inside Iran and abroad. This means that Raisi need not worry about financing his campaign. Ebrahim Raisi has promised to fight unemployment and corruption, and to care for the poor. He regularly visits the poorest neighborhoods in the country, has his picture taken with the indigent and hands out sugar and flour in the name of Imam Reza. He is also a favorite guest at Iran's state-run radio and television station, IRIB. Religious leader Ayatollah Khamenei personally appoints IRIB's managing director, who therefore belongs to the county's conservative circle. Raisi's speech after registering as a candidate was broadcast live by Iran's foreign television station, PressTV. In conservative circles, Raisi is seen as a potential successor to the 77-year-old Khamenei. Raisi was Iran's attorney general until 2016. One of the most powerful men in Iran's justice system for the past 30 years, he often called for harsh punishment, such as the stoning of adulterers. In 1998, he was a member of a council that sentenced thousands of political prisoners to death in a matter of weeks. The prisoners were swiftly executed and buried in unmarked mass graves. To this day, the families of the executed are still searching for the graves of their loved ones. This is the third time that the mayor of Teheran has been a presidential candidate. In 2005, he ran against then mayor of Tehran, Mahmoud Ahmadinejad, and lost. After the election he took over Ahmadinejad's post as mayor. Qalibaf ran for the presidency again in 2013, and lost to Rouhani. Right now, Qalibaf is one of the most controversial politicians in Iran. According to the Teheran City Council, Ghalibaf has put the capital 1.7 billion euros ($1.8 billion) in debt. The Council reported on a number of projects that began with massive advertising campaigns but were never completed. Ghalibaf is also accused of having created some 4,200 new high-paying city administration positions, which he then filled with unqualified personnel after opaque application processes. Nevertheless, Qalibaf can, thanks to his press and public relations departments, mobilize a lot of voters in the capital. The press department also has a social media team. Although, it must be said that their idea of having the candidate photographed wearing shoes at a swimming pool was not very bright. According to official sources, more than half of Iran's 80 million citizens are active online. Access to popular social media sites such as Facebook and Twitter is blocked by the Iranian government, but many Iranians get around government censorship by setting up VPN connections. The former cultural minister (1992-1997) was the first candidate to register for the presidential election on April 11 - and he did so in work overalls. Mirsalim says that he is prepared to end Iran's economic stasis, create new jobs and bring mass production up to speed. However, the 70-year-old has yet to explain how he will increase productivity in the oil-dependent country. Thus far, the only hint he has given is that with his "bag full of ministerial experience" he knows just what the country needs. Mirsalim was one of the most controversial cultural ministers in the history of the Islamic Republic. Currently, an old newspaper article from his days in that position is making the rounds on social media. In the article, he describes journalists as "mindless" and explains why he "would not place the priceless crown jewel of freedom of the press in their hands," even though it is guaranteed in the country's constitution. The reason: "The stupid press does not know how to deal with freedom." Jahangiri is currently serving as the first vice president of Iran under Hassan Rouhani. The former minister of industries and mines (1997-2005) under Mohammad Khatami is one of the most important politicians in the reform camp. He registered at the behest of several well-known personalities. Reform politicians announced that they would present two candidates for the presidential election. That seems to suggest that they do not have much faith in Iran's current political system. It is expected that Jahangiri will eventually bow out of the race and throw his support behind Rouhani. Hashemitaba was vice president of Iran under its influential former president, Ali Akbar Hashemi Rafsanjani, who died this January. Hashemitaba is seen as a reform politician and is running for the presidency for the second time. In 2001, he lost to sitting President Mohammad Khatami. Under Khatami, Hashemitaba served as director of the Islamic Republic of Iran's Olympic Committee. His chances of defeating Hassan Rouhani are very slim. On Thursday, the Guardian Council barred ex-President Mahmoud Ahmadinejad, his longtime advisor Hamid Baghaei and Mohammed Hashemi Rafsanjani, the brother of former President Ali Akbar Hashemi Rafsanjani, from standing for election.